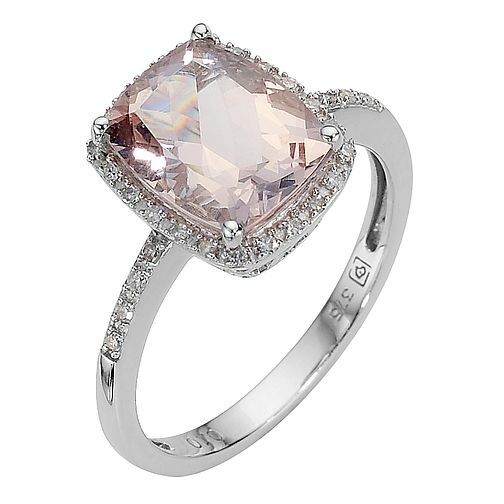 Indulge in the fine pink tones of morganite alongside dazzling diamonds with this elegant 9ct white gold ring. A real showstopper, complete with glittering diamond set shoulders for extra sparkle. 9ct white gold morganite and diamond ring is rated 4.2 out of 5 by 20. Rated 3 out of 5 by Anonymous from Lovely ring but diamond needs to be replaced already! This is my engagement ring, my husband to be proposed on Christmas Day 2017. Lovely ring but needs regular cleaning to keep the sparkle as the morganite stone can look dull. By September 2018 one of the small diamonds has fallen out. Awaiting a reply from Ernest Jones regarding this. Quite hard to find a band to go with it too, will have to have one specially made. Rated 4 out of 5 by Anonymous from So beautiful but not an everyday ring This is my engagement ring it is absolutely beautiful and I was so pleased my partner had picked it because it is something different. However it has been on my finger for less than 2 months and has already had to go off to be repaired. The claws catch everything, hair, towels, clothes and eventually one has snapped off with a couple of others loosening. They lady in the shop was helpful but I am absolutely gutted. Hopefully it can be fixed (the downside being after it’s been sent off for a month!!!!! ).